Here are some flying stories I wrote about some of the more dramatic moments in my flying career. There is some overlap between some of the stories. 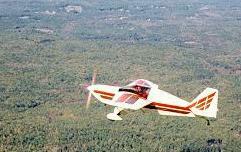 The story about building and flying my plane is a nice overview. It was written for a aerobatics club magazine but unfortunately got lost in the shuffle during a change in management. The midsummer adventure was never completed, but I like what is there. My favorite one is the one about my first contest. The one about my crash is sad, but very powerful, at least for me. The FAA report will probably be boring unless you are really a technohead.